State officials have ordered an inspection of Moccasin Creek Dam located in Tuolumne County, after it was on the verge of failure on Thursday afternoon, according to The Tuolumne County Sheriff's Office. Senior Investigative Reporter Stephen Stock reports. State officials have ordered an inspection of Moccasin Creek Dam located in Tuolumne County, after it was on the verge of failing Thursday afternoon, according to San Francisco Public Utilities Commission. 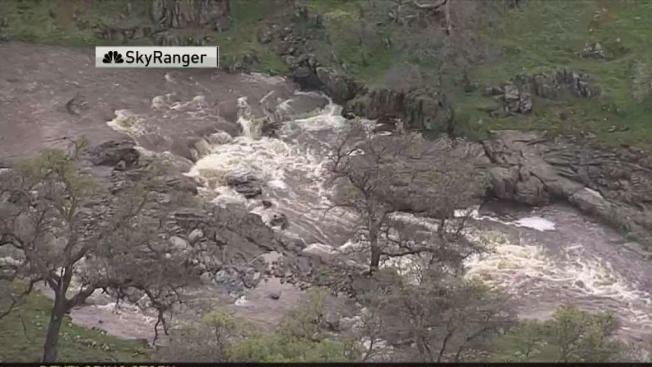 The dam located in a remote area of the Sierra Foothills prompted an evacuation and a flash food warning. If it failed, large quantities of water would have moved down the creek to Don Pedro Reservoir. The close call comes one month after NBC Bay Area’s Investigative Unit aired a year-long investigation into the safety of California’s 1,585 dams, including Moccasin. We found a memo written by engineers at California’s Department of Water Resources (DWR) in June 2017 that raised safety questions about seven dams owned and operated by the agency. Our investigation found more than half of California’s dams carry a high hazard potential. Seventy-five percent of those dams are earthen dams and 80 percent of those were built before 1970. 'Imminent Dam Failure' Prompts Evacuations in Tuolumne Co.
Construction on Moccasin Dam, which qualifies as an earthen dam, was completed in 1930. The California Division of Safety of Dams rated the condition as satisfactory back in September 2017. Moccasin dam is owned by the San Francisco Public Utilities Commission and is part of the Hetch Hetchy Aqueduct System that delivers fresh drinking water to the Bay Area. SFPUC told NBC Bay Area’s Investigative Unit there is currently no threat to the Bay Area’s water supply. The small reservoir holds 554 acre feet of water, making it more than 6,000 times smaller than Lake Oroville. The 60-foot dam also has a hydroelectric plant on site, providing power to the Bay Area.